Arlyn’s veterinary scales make weighing four-legged, or even no-legged patients easy. 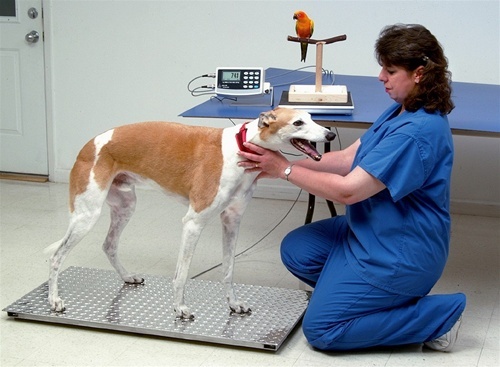 Their animal scales, whether custom or standard, are the perfect electronic scales for veterinarians, kennels, labs or anyone handling medium to large size animals. Handling animals of such a great size and girth could pose potential problems when it comes to weighing the animal properly. Whether weighing the animal for weight control or medication dosing, in either case, the readings have to be accurate. For example, the animal could be unstable and not really used to being in such a controlled environment. For this reason, it refuses to get on the animal scale. The other extreme case is that when it steps onto the veterinary scale, the animal kicks and scratches the scale. This makes it imperative for the digital scale to be rugged for any of these particular environments. Obviously, one of the most important features is the ruggedness and durability of the digital scale. Calibration is also another important factor when it comes to weighing. Scales need to be properly balanced. All of Arlyn’s bench scales, platform scales or even floor scales are balanced and calibrated at the factory, eliminating the need for an installation technician, which can save a ton of time, money, and resources. Simply place the scale in the desired spot, turn it on, and you’re ready to weigh. On the other hand, Arlyn’s bench scales, floor scales, or even platform scales must be lightweight and transportable. For best portability, they may need to run from battery power. A long life, rechargeable battery pack adds another level of convenience. When buying a scale, the most critical components of the scale are the load cells. They are carefully attached to the scale platform. They convert the weight of the animal on the platform into an electrical signal that may be converted into a digital number to be shown on the electronic indicator. Arlyn’s veterinary scale designs are so dynamic; they allow you to compensate for weight build up manure, mud, or snow build-up on the scale surface with the touch of a few buttons. Due to the various overall sizes and weights of all the different animal species, Arlyn provides a wide range of scales for use in any animal environment. One such scale is a bench scale. This type of scale is perfect for weighing smaller animals, such as lizards, rabbits, birds, amphibians, reptiles, and cats. For the larger animals, the scale of choice would be a platform scales. These scales can typically weigh up to 1000 lb. These would be found in zoos instead of smaller veterinarians offices. They would weigh monkeys, alligators, smaller hoofed animals, and nearly all others. Even marine animals would be appropriate. Typically a low profile platform scale or floor scale would be found in these environments. Designed for horse and large animal applications, these scales combine low profile design, aluminum construction, and a durable construction to create a scale ideally suited for any farm or stable environment. Aluminum construction and stainless steel make these an easy to move and easy to level weighing platform which is impervious to weather and corrosion. The digital scales used must be able to withstand a wet environment, as they may often need to be washed after use. The electronic scales will probably need to be moved to different locations to serve a number of different animal habitats. Weighing scales play a key part in a number of different roles at the zoo. Usually, the amount of food required by the animals must be weighed. Sometimes they are used to provide medication for the animals based on weight. At farms where they raise pigs and cattle, Arlyn provides a custom-made swing gate where the animal proceeds to three different places based on their own weight. If they are at their desired weight they go into a pen where standard feed rations are administered. If they are underweight, they are directed through an electronic gate into another pen where they may be primed for higher nutrition feeding. The precise weights of these animals are extremely important. In environments where breeders are given bonuses for animals which are shipped at the buyer’s desired weight, a scale is very important for this type of business.